Closing date for online entries is 16th January 2013 at 5pm. 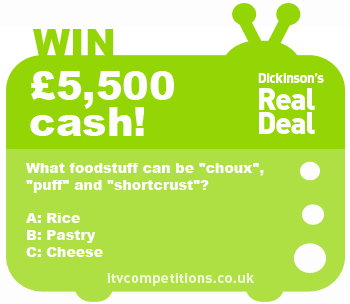 What foodstuff can be “choux”, “puff” and “shortcrust”? You can enter the Real Deal competition 3 times via the itv.com competitions entry page. With a different competition announced every day you have loads of chances to win a massive cash prize for free!